I just couldn’t take it anymore. Our large bathroom cabinet just wasn’t cutting it anymore. Everything was all over the place and both mine and my husbands stuff was all over the place. I mean we knew where everything was that we needed, but it was a mess and there was a lot of stuff that needed to be purged. So I completely cleared our counter top and took everything out and organized it on the counter. Anything that we didn’t use anymore or was expired went into the recycle bin or the garbage. It felt so good to get rid of things in there. A couple of weeks ago I found these cute little 2 packs of long thin trays at Target. I love you Target for always having the right things at the right time for me. These were in the $1 section, so since they were a pack, they were really 50 cents each. SCORE!!! So for $3, I had 6 trays to work some magic with. I’ll be honest, everything doesn’t fit perfectly inside of them because they are thin, but it works so much better then the way we had it. Now I can find things easier, we have extra room and it looks organized. I love it!!! 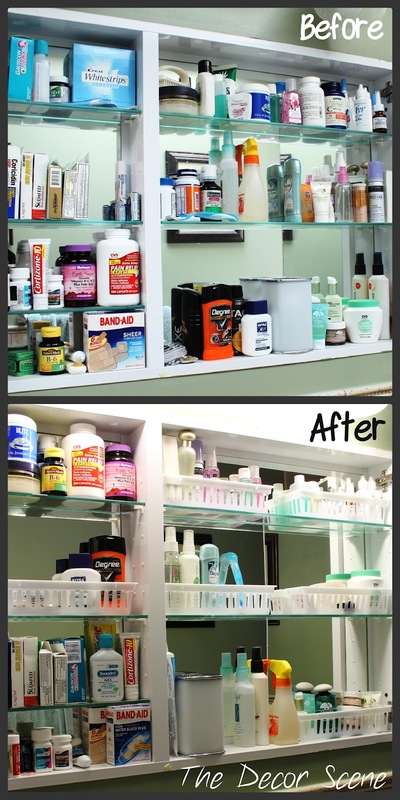 So have you organized your bathroom cabinet recently? What did you use to organize it? Did you find things that you completely forgot about and was expired for a couple of years? Do tell. Share away with the rest of us. You can put a link to your story in the comment section if you want. We would all love to hear about it. You can check out other updates I have done in the bathroom, here, here and here. Thanks for stopping by everyone. Have a great day!!! Love your new blog, Jen! Latoya did a great job! Your cabinet is so organized. Great job! Thanks Brandi!!! Latoya did do a great job. Thanks, that cabinet was driving me crazy…it had to be done. Hi Jen, you've just inspired me to reorganize my bathroom cabinet first thing in the morning. I have a stack of those little trays sitting in a box. I used them to organize the drawers when I had a large desk. When I changed to a smaller table I didn't need them anymore and they've just been sitting. Just what I need to keep things from falling out when I open the doors. lol Thanks so much for sharing. I'm a new follower and found you via Don't Disturb This Groove. I'd love if you'd stop by for a visit and feel free to link up to Frugal Treasures Tuesday also. I'm glad I could inspire you Barbe. Good Luck with your reorganization of your bathroom cabinet. It's the little things that keep us happy in our homes. Have a great day. Can't wait to stop by your blog. Thanks for stopping by. The new look is fab! Thanks Comeca and thanks for stopping by. Our Family Room was Featured on…..